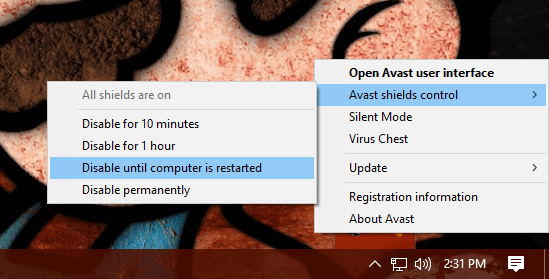 Seeing Avast background service is not running error on your Windows 10 PC? Check out this post to read about all the possible ways to troubleshoot the issue. Windows Defender is the default antivirus program of Windows 10. Not all users find it useful when it comes to the overall protection of their system from malicious files. And due to this reason, they install some of the best antivirus programs available for Windows 10. The third party antivirus program available for Windows 10 offers some additional features in comparison to default Windows Defender. 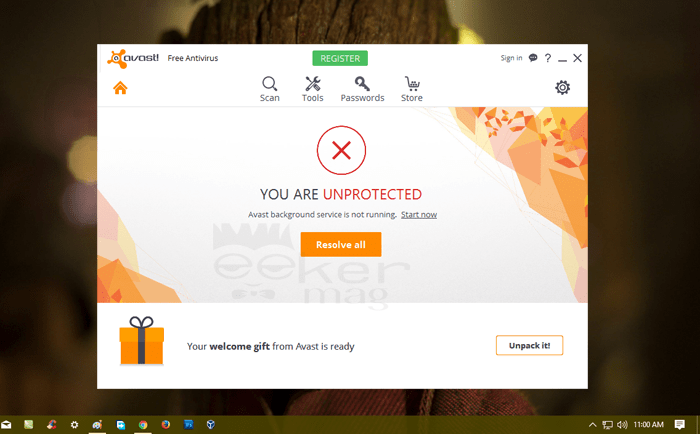 Normally users facing this issue after they updating Avast antivirus to the latest version available. This is really a scary error as due to this reason antivirus is not working properly. Note that the first two tips worked fine for almost all the users facing the problem. If this fails to fix the issue, then try the next tip. 1. 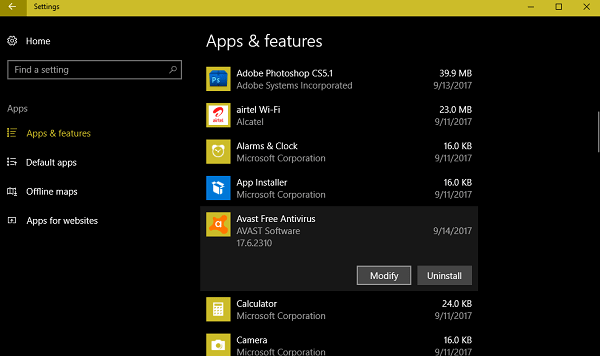 First, uninstall Avast antivirus from Windows 10. For that open the Settings -> Apps– > Apps & Features. 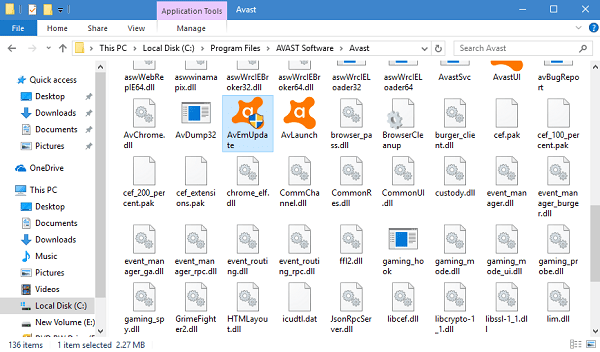 On the right side, find Avast Free Antivirus or related and click on Uninstall. 1. For that, you again need to launch settings app and navigate to Apps – > Apps & Features. Look for Avast on the right panel and click on it. 2. Here you need to click on the Modify button instead of Uninstall. When UAC dialog box appears, click Yes to continue. 3. 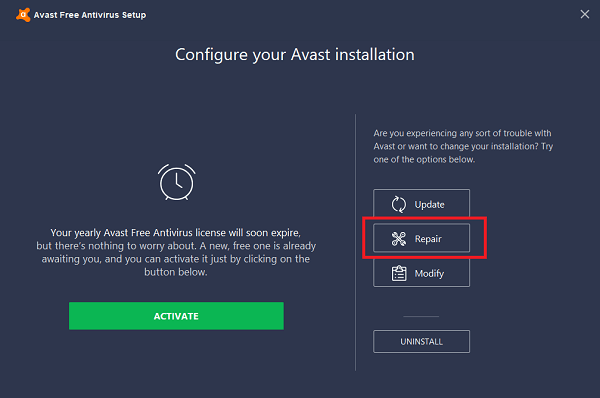 Avast application window will open, here you need to click on the Repair button. You can use the same procedure to Update and Modify the program. After the process is completed reboot the system and check if this fixes the issue. Note: In case, Repair didn’t work for you, then you can also try to update the antivirus using the above-discussed procedure. If not head over to next suggestions. Make a right-click on on the Avast icon available in the system. 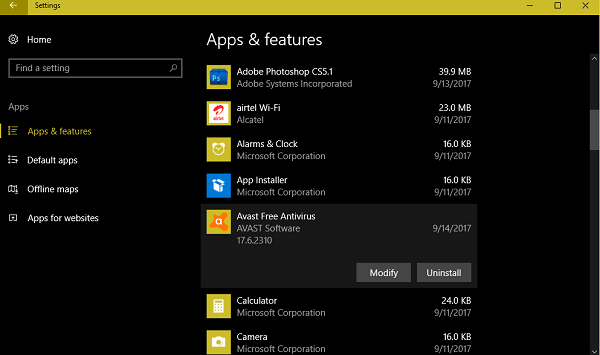 In the context menu select Avast Shield Control -> Disable until Computer is restarted. Reboot your system. Now check if this fixes the issue. 1. 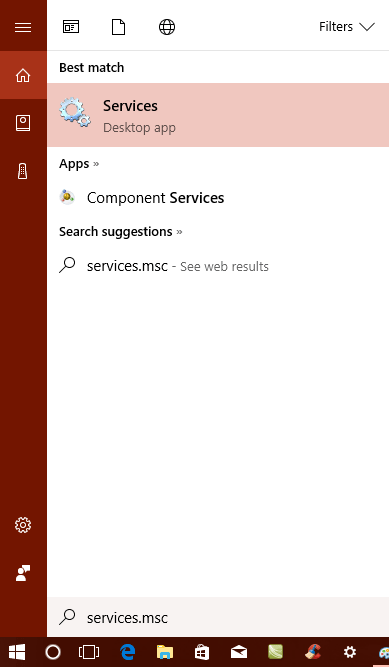 In Windows 10 start menu search type services.msc and when the same Services desktop app appear in the results click to open it. 2. Here you need to look for service named as Avast Antivirus. Double click and it will open the Avast Antivirus Properties window. Head over to Startup type section and set it to Automatic if not already using drop-down. 3. Reboot your Windows 10 PC. 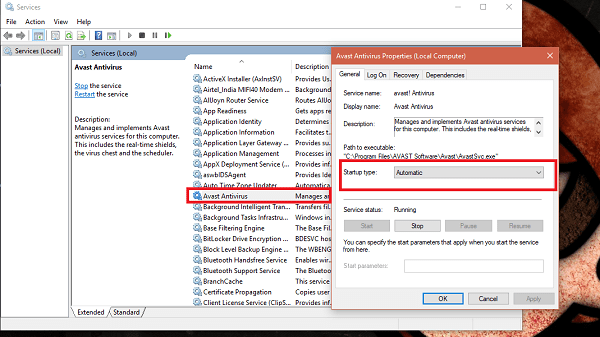 So these are some of the possible ways which you can employ to troubleshoot the issue Avast background service is not running in Windows 10. Try them out and let me know which helps you.